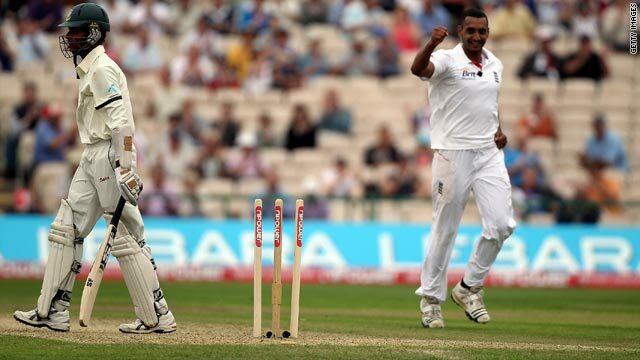 Seam bowler Ajmal Shahzad took three wickets on his Test debut for England as Bangladesh collpased at Old Trafford. (CNN) -- England's cricketers are heading for a second successive victory over Bangladesh after the Test minnows collapsed late on the second day in Manchester. In reply to the hosts' first innings of 419, Bangladesh lost all 10 wickets in the final session to waste an opening partnership of 126 between Tamim Iqbal and Imrul Kayes. Tamim smashed 108 off only 114 balls for his second consecutive century, but when he fell at 169-3 it signaled the start of the end as the tourists were cleaned up for 216 and now face the prospect of having to bat again on Sunday at Old Trafford. Spinner Graeme Swann claimed 5-76 and debutant Ajmal Shahzad returned figures of 3-45. "Obviously going up to tea things weren't going great for us," said Swann, who picked up his first five-wicket bag in a home Test after taking none at Lord's. "But we regrouped and had a discussion with our bowling coach David Saker and came up with a plan that worked perfectly as we took 10 wickets in the final session. "You never expect to take 10 wickets in a session, that is outstanding and I can't remember that happening in my career." England had resumed on 275-5, with Ian Bell unbeaten on 87 and wicketkeeper Matt Prior on 21. They added another 101 runs to take their partnership to 153 before Bell was bowled for 128 by Shakib Al Hasan, scoring his 11th Test ton. The left-arm spinner ended with figures of 5-121 as he also dismissed Prior for 93, with England losing their last four wickets for 21 runs.